The 20th century is half done. The world has just emerged from the depredation of World War 2. Queen Elizabeth II's ascent to the throne is imminent, as is India's independence. England begins to recuperate. So does its automotive industry. Rolls-Royce, a car manufacturer mandated to build aircraft parts under Britain's 'Shadow' scheme for the war, moves back to what it did best  manufacturing cars, at its new Crewe facility. The first two creations, embodying the optimism of a brave new world, were the Silver Wraith and the Silver Dawn. Half a century and two decades later, the company finds itself as the cusp of another metamorphosis. The Silver prefix is dropped. The Wraith name has already resurfaced presenting a foretaste for the brand's future  it is time now for it to lose its roof and make space on the centre stage for the new Dawn. 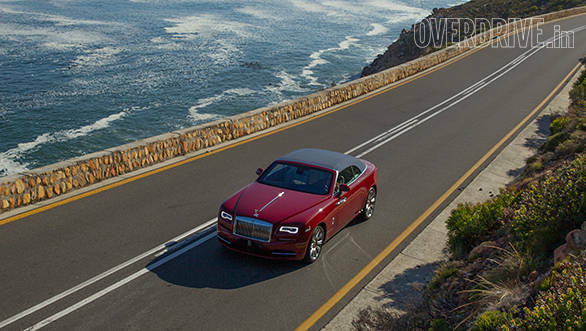 But calling it the Wraith convertible wouldn't do justice to it, as I found out on an exclusive first drive in South Africa. Let's start with the name. Rolls-Royce cars have been hitherto christened Phantom, Ghost, and Wraith - eerie, scary names of elusive creatures that make their mysteries in the dark of night. If the nights are always darkest before the dawn, it follows that the dawn must herald a new light! As a new avatar steps forward from the shadows of the Phantoms and the Ghosts, Rolls-Royce Dawn seems like an apt name for a car that shall make the can-be-nothing-but-exclusive brand more affable and endearing. 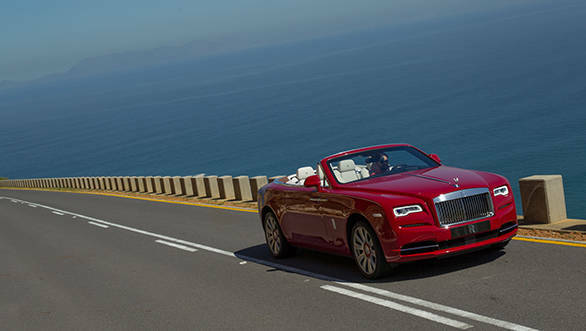 The Dawn isn't the first convertible the company's developed, but Rolls-Royce communication reckons  and believe this  "the Dawn is the sexiest car Rolls-Royce has ever built!" I personally am of the opinion that no modern Rolls-Royce stands a chance against the age of the coach builders, the likes of Figoni et Falaschi and Park Ward, simply because the coach builders had so much freedom. But I'll let you be the judge of that. Fact is, the Dawn has the right to distinguish itself from the Wraith. Much like in the age of the coach builders, they share the chassis and the engine, but 80 per cent of the body is new. What I love about the Dawn is something I can't say about many of the modern day soft tops  it looks handsome even with the roof up. The fabric manages to hide the ribs of the retracting mechanism and gives it a pleasing form. Chief Designer Giles Taylor confirms that that was one of the most important mandates for the design team, alongside retaining the simplicity of form. But it's simple to the untrained eye. Closer inspection lets you appreciate the sheer impact of lines. The windscreen has been raked even further back than the Wraith, the signature Parthenon grille's bars have been recessed ever so slightly and Lady Thornton (or the Spirit of Ecstasy as some of you know her) leans harder into the wind. In fact, the whole car seems like it is inclined forward. The tyres (run flats) and wheels are brand new as well and designed to match and enhance the convertible's form. The insides are an interesting concoction of contradictions  you have a minimalistic ergonomic arrangement adorned by the best quality of materials you can imagine. 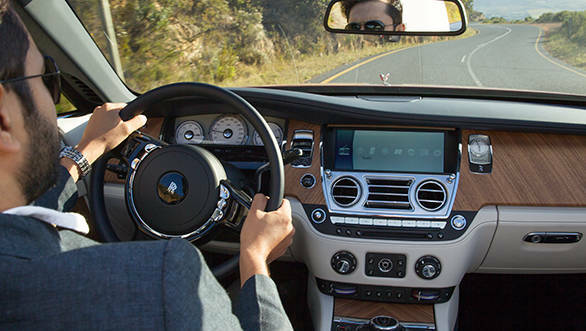 The design is stately but beneath its imperial poise nestles some of the best infotainment technology. The BMW-borrowed iDrive system is still one of the most multifarious and exhaustive. But once you get past its learning curve it is just as easy to use as your everyday smart devices. It isn't about fiddling with superfluous buttons anymore. You simply pull and pinch or draw letters on a touch pad. The other bit of ingenuity is the adapted Bespoke audio system which I tried out, to the delight of passerbys and maybe to the annoyance of some with the roof down. It has been calibrated and fine tuned by audio engineers to suit either of the Dawn's dual personalities. When the roof drops it adjusts the 16 individually tuned speakers to perfectly balance the acoustics. "We wanted to make the roof retracting process dead silent". Of course! Such a Rolls-Roycey thing to do. The canvas roof folds neatly into the boot  a 22 second process that proceeds smoothly at speeds up to 50kmph. What it reveals is the automotive equivalent of a yacht's wooden deck that wraps itself around the rear passengers and the Canadel pore wood flows into the cabin. It also reveals four seats  all equally usable to the Dawn's credit. Sure, you miss out on the star light headliner but how does that matter really when it opens up to the real sky and stars for you to behold! The coach doors are hinged at the strongest area (at the B-pillar) doing away with added reinforcements that would become necessary at the A-pillar. The extra 200kg doesn't sound that much considering the Dawn weighs over two and a half tonnes. 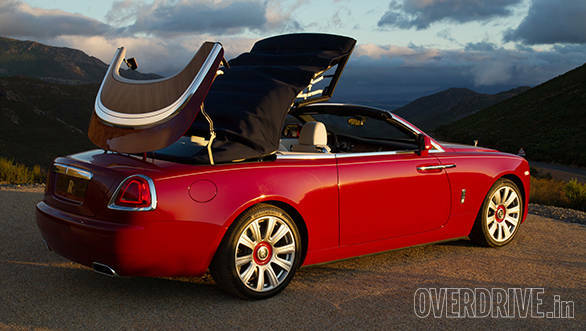 Rolls-Royce also wants to market the Dawn as the most silent convertible ever built. With the roof up it is almost as insulated from the outside world as the Wraith is, which is commendable. But with the roof and windows down, the wind buffeting is definitely palpable at speeds over 80kmph, especially through the gap between the A-pillar and the ORVMs. Driving with the windows up certainly helps but who does that in a convertible! The noise insulation isn't perfect then, perhaps the introduction of wind deflector screens at the back would help reduce the noise immensely. The grapevine holds that is a distinct possibility with the final production version. The other reason the wind is noticeably loud is the absence of any sound from the engine. At speeds below 50kmph it is so silent you'll hear the rustling of the trees you drive past. Then when you decide to wake up the waiting horses, the storm they unleash is as silent as the lull before it. The 6.6-litre twin-turbo V12 will soon have to make way for greener powertrains  could be smaller engines, could be alternative powertrains. But at the moment it continues to serve the Dawn. It is tuned a bit differently to the Wraith. Shelling out 570PS of power and 780Nm of torque, its character has been altered to suit a more relaxed drive. It feels less eager and responsive than the Wraith and loses out to the coupe by about half a second in reaching the ton. In fact it feels quite similar to the Ghost's state of tune. The accelerator pedal has been remapped to increase response in the mid-range instead of the low-end. The ever faithful 8-Speed ZF gearbox still does duty very ably and it suits the driving characteristics of the Dawn. It also borrows the Satellite Aided Transmission system that debuted on the Wraith which gives the gearbox a GPS based intuition that easily trumps human judgment. It essentially anticipates the road conditions ahead, gauges your driving style and preps the gearbox for changes accordingly. Considering Rolls-Royce claims this to be the most rigid convertible in the world, the dynamics should be identical to the Wraith. They aren't. Initial impressions suggest that the suspension set-up has simply been stiffened but that would be inaccurate. The springs have been redesigned and there's a new active roll bar to reduce body roll. This is what makes the ride feel a bit firmer than other Rolls-Royces. The shorter wheelbase and wider track when compared to the Ghost definitely gives it more dynamic ability but don't expect it to defy physics and move like a sports car. Rolls-Royce engineers are good but they aren't magicians. 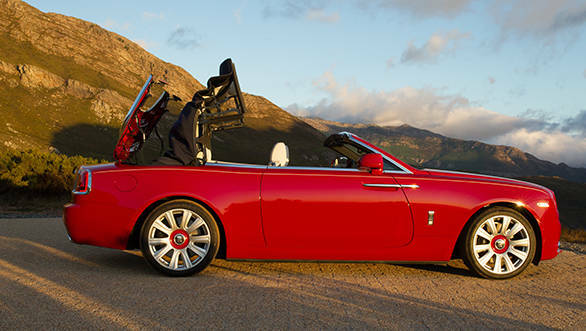 It is a grand tourer just like the Wraith and that it personifies rather well, even with the roof down. With over-engineered cars like the Dawn, you often have to don a large magnifying glass and your pickiest journalistic tools to find fault, and more often than not they're personal. But if I had to dig up negatives at the risk of sounding fastidious  one would be the rear visibility through the smallish rear windscreen with the roof up. That lovely wrap-around wood panel at the back lobs a reflection on the rear windscreen further hampering visibility. Thankfully, the Dawn has large ORVMs and of course, with the roof down there's no problem at all. Much as they did with the Wraith, Rolls Royce is aiming to serenade new customers with their cars. With the Dawn, it focuses its sight on the young. La Dolce Vita they say as they parade the Dawn. 'The sexiest Rolls-Royce ever built', they whisper; 'the most silent convertible in the world', is their claim. 'The most powerful four-seater, soft-top convertible in the world', is the roar you hear. Rolls-Royce is doting on the Dawn, she is the prodigal child, the prodigal of superlatives. 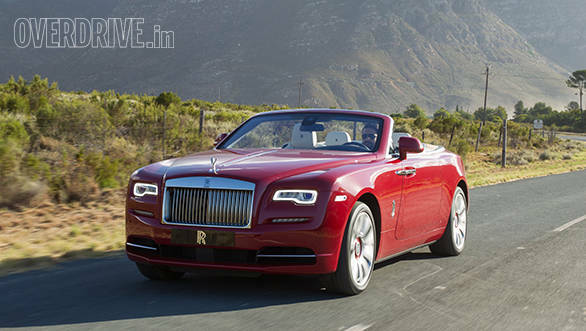 The Rolls-Royce Dawn is set to be available in India from June 2016 and we are expecting the prices to start at Rs 6 crore.